Readers make all the work worthwhile, so I’m glad you’re here! Want to read them early? Send a message to me? Or have a book club and want to purchase multiple copies or set up a chat? Discover which of my books include your favorite elements! Have questions for me about my writing? Or have questions about my stories? Do you have a printable list of all the books in order? Yes, I do! 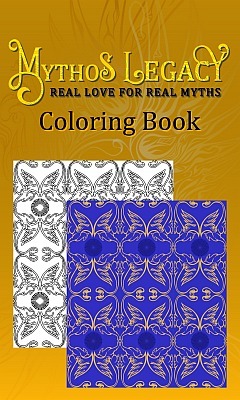 Find the printable list of all the book in the Mythos Legacy series (in order) here. What bonus information can you share for your stories? If you scroll down on each book’s page, you’ll find tabs with teaser graphics, hints of how the story ties to the other books, and behind-the-scenes information. Do you have fun extras for your books? In addition to the teaser graphics and background information on each book’s page, I’ve had fun creating animated gifs for each cover and a coloring book for the whole series! Where can I find excerpts for all of the Mythos books? Like many readers, I was first introduced to the paranormal romance genre through vampire stories. Later came shifter stories in the form of werewolves. Then in 2010, I read my first shapeshifter story for a race that wasn’t commonly thought of as a shifter: a dragon. A whole world of possibilities opened before my eyes, but of course, I wanted to do something different. So I came up with a female dragon shapeshifter and thought about what type of person she’d be. Elaina, my jewel thief of Treasured Claim, was born, and she soon had me obsessed with telling her story. After that, I wanted to expand the idea into a series, so I started thinking about other mythological beings I could develop. To explain where they all came from (and usually lived), the Mythos plane, the source of Earth’s mythology, came to be. And I’ve been happily sharing their stories ever since! What can I look forward to in the series? I’m also working on a spinoff series called Brothers of Stone based on Stone-Cold Heart, the fourth Mythos Legacy novel. The spinoff follows the adventures of the gargoyles of Garrett’s regiment as they discover the possibilities of their new life. Do you have any deleted scenes to share? However, that means I don’t have deleted scenes to share with my readers. Someday, I might create bonus slice-of-life or epilogue-style scenes to share, but right now, my focus is on writing my books. How did you come up with your cover designs? The Mythos Legacy series is a tricky one to come up with a cover design that works for all the books. 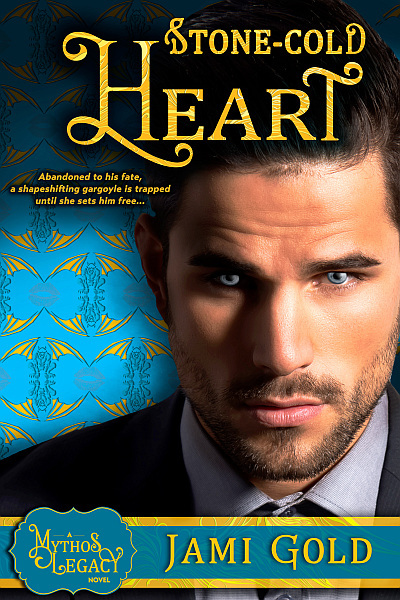 Paranormal romance books often feature a lot of man-chest, moonlight, and fangs for vampire-type stories or a wolf, bear, or whatever in the background for shifter-type stories. However, not every book in Mythos features a shifter, and more importantly, half of the books star a human hero, as the heroine is the paranormal member of the couple. In other words, it would be difficult to include a focus on the guy and the paranormal aspect of the story at the same time. The other main style of cover is to include the hero and heroine together in a “clinch” pose. But as my characters (human and paranormal) come in all colors, and the vast majority of stock photos used for cover images feature white models, I knew it’d be hard to find good matches for that approach as well. My current cover design tries to capture a fantasy, a romance, and a paranormal look—all in one. I’m not sure if I was entirely successful, but until I have a better idea, I’ll enjoy them as they are. Are there any hidden meanings in your cover designs? Some of the design is determined by how the paranormal character alternates between a hero and a heroine from book to book. Accordingly, my covers alternate sides (with the face along the spine vs. along the pages) and colors (red shades vs. blue shades) with each book to match the paranormal character (heroine vs. hero). Gryphon and Sunlight: The sun is both the symptom of Griff’s curse and the imagery for Kala in Unintended Guardian. Dragon and Ruby: The ruby is both symbolic of Elaina’s need for treasure and an image of her talisman in Treasured Claim. Unicorn and Rose: Markos always describes Celia with rose imagery and she grows into her strengths in Pure Sacrifice. Fire Faerie and Mandala: The design on Kira’s palm focuses her power, which she tries to control in Ironclad Devotion. Gargoyle and Lips: A kiss is very important when Raquel uses it to awaken Garrett in Stone-Cold Heart. While Jami’s blog focuses on the craft, business, and life of writing, some of her posts cover topics that might interest readers too. These include news about her book releases and contests, as well as some fun stuff about her and her thoughts about the romance genre, books, and reading in general. Or you can find all her posts for Readers at this link. The romance genre is often called "aspirational," but even romances with a happy ending can fail at being uplifting. What other elements contribute to an uplifting story and what can they teach us about other genres? Many have valid concerns about the ethics of using ghostwriters, but there's a difference between the ethical use of professional ghostwriters and "author mills." Shiloh Walker shares her insights into shady behavior. In the recent scandal known as #CopyPasteCris, Cristiane Serruya plagiarized a lot of books. We're looking at how it happened and what (if anything) can be done to prevent it from happening again. It's often not easy to be a romance author, and the time around Valentine's Day can be especially trying. A whole day (or week) focused on love and romance brings out all types of naysayers for the romance genre. Aspiration is "a hope or ambition of achieving something," such as we see with the #RelationshipGoals tags on social media. Not surprisingly, our hopes and goals are sometimes reflected in the stories we write or the books we read. Like many authors, I started writing because I love to read. Of course, there's no such thing as too many books, so I wanted to share this tool that might help save our wallets. Many authors dream of working with books beyond just writing them and become editors, agents, librarians, or booksellers. In fact, Angela Quarles, my writing bestie, is opening a bookstore! And she's looking for suggestions to make her genre- and writer-friendly shop among the best. A recent post by Diana Hurwitz explored the nature of antagonists in romance novels. Today, we're taking a deeper look at our options for antagonists, especially in the romance genre, and how we can avoid creating unhealthy relationships. It's that time of year again. My eight-year blogiversary is coming up on July 12th. And I'm once again amazed by the fact that I've been writing this blog for eight years. How can something feel like yesterday and forever at the same time? Whether we want to know for real-life purposes or for our writing, Bran's post today helps us identify elements of healthy romances. Authors need to be careful of sending readers the wrong message. Everyone deserves to be in a healthy, loving relationship—including our characters.